Barn owls are one of the few owl species that take to bird houses readily, so give them a home to meet all their needs with the Coveside Assembled Barn Owl House. This massive dwelling is constructed of kiln-dried, Maine White Pine, rough-sawn so that owlets have a foothold when they are ready to vacate the nest. Over time, the pine will weather to a natural gray and blend in with its outdoor settings. The 0.75" thick, pine walls keep the roost insulated from both heat and cold, while ventilation holes along two sides of the shelter allow for air circulation and temperature regulation. Drainage holes and a slanted roof help keep the interior dry, providing a healthy environment for barn owls. Also included, you'll find bags of wood chips for owls to use as nesting material. To clean out old nests, unscrew and remove the lid, or simply reach your hand inside the entrance hole. Situate this home 10 to 20 feet high in a barn or shed, or on a tree in open farmland or at the edge of a forest. It is best to mount this house on a shelf for extra support, before screwing into a wall or tree. The generous size and unique features make this home a fantastic and favorite garden addition. 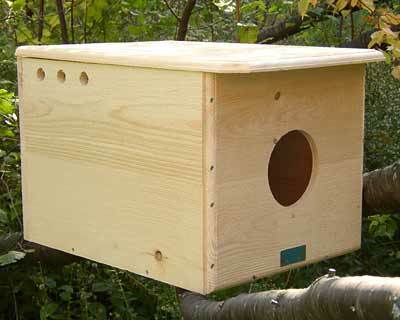 Provide a home for amazing owls with this Assembled Barn Owl House. Made in the USA.